Ali ibn Abi Talib, the fourth (last) Rashidun caliph and first Shi'ite Imam was assassinated by a Kharijite called Ibn Muljam on 26 January 661, at the Great Mosque of Kufah in present-day Iraq. Ali, who was then 62 or 63 years of age, died due to his injuries two days after Ibn Muljam struck him on his head by a poison-coated sword, on the 21 (or 19) Ramadan 40 AH (28 January 661 CE). He was the third successive caliph, after Umar and Uthman, to be assassinated. Ibn Muljam met up with two other Kharijites namely al-Burak ibn Abd Allah and Amr ibn Bakr al-Tamimi at Mecca, and concluded that the situation of the Muslims at the time was due to the errors of Ali, Muawiah and Amr ibn As, governor of Egypt. They decided to kill the three in order to resolve the "deplorable situation" of their time and also avenge their companions killed at Nahrawan. Aiming to kill Ali, Ibn Muljam headed toward Kufa where he fell in love with a woman whose brother and father had died at Nahrawan. She agreed to marry him if only he could kill Ali. Consequently, Ali was stabbed by Ibn Muljam at the Great Mosque of Kufa. After Ali's death, Ibn Muljam was executed in retaliation by Hasan ibn Ali. Ibn Muljam along with two other men, namely al-Burak ibn Abd Allah and Amr ibn Bakr al-Tamimi, all considered as belonging to Kinda, met at Mecca and had a long discussion after the pilgrimage ceremony. They concluded that the situation of Muslims at the time was due to Ali, Muʿawiya and Amr ibn al-As, "whom they regarded as being in error", and swore to kill them to also "avenge their companion's massacred at al-Nahrawan." They arranged the date of assassination and each of them chose his victim. Two types of traditions exist regarding Ali's awareness of his fate long before the assassination. This foreknowledge was through his own "premonition of it" or by Muhammad. Based on numerous traditions, Ali's beard staining with "blood flowing from his head" had been revealed by Muhammad or Ali. Another set of traditions by Muhammad says that "the most evil man among the ancients was he who had killed the camel of the prophet Salih and among his contemporaries, he who would kill Ali." The night of the assassination, Ali said that his fate was about to come true, and when he left home in the morning, "geese followed him, cackling" weeping for his funeral, as he said later. In Kufa, he encountered a group of people from Taym al-Ribab tribe who were mourning ten of their tribemates killed at Nahrawan by Ali's army. Among them was a woman named Quttaam. According to cleric Ali al-Sallabi, on seeing Quttaam, he "lost his senses" and "forgot the assignment" for which he was roaming, and proposed to her. Quttaam said that she would marry him if he could "heal" her by giving her three thousand dinars, a chanteuse, a male slave and the death of Ali. Quttaam wanted revenge too as her father and brother had been killed by Ali's forces at Al-Nahrawan. Ibn Muljam persuaded a man called Shubayb to assist him in killing Ali. :79 Besides Shablb ibn Bujra, Wardan ibn al-Mujalid also were Ibn Muljam's accomplice. :308 The conspirators stationed themselves opposite the door from which Ali would enter the Mosque. Al-Ash'ath ibn Qays was the chief of Kindah tribe in Kufa. :83 According to Wilferd Madelung, in the final years of Ali's reign he had tendency towards Muawiah and received letter including offers of money from him to show reluctance about Ali's campaign against Muawiah. :276 Some sources have accused al-Ash'ath of being informed of the plot of the assassination of Ali. According to al-Yaqubi, Ibn Muljam was hosted by al-Ash'ath for a month when Ibn Muljam had been preparing his sword. Another report by Ibn Sa'd says that al-Ash'ath stayed the night of the killing at mosque counseling Ibn Muljam and that al-Ash'ath signaled the time of attempting the assassination by saying "the morning has smiled." The majority of the sources narrates an ambiguous phrase from Al-Ash'ath:"the dawn has risen for thee" and those who has Shia tendency give it as a clear encouragement to Ibn Muljam: "Deliverance, deliverance! The dawn has risen for thee." After assassination, Hujr ibn 'Adi accused him for Ali's murder. There is even a report which says he warned Ali about Ibn Muljam. According to Laura Veccia Vaglieri, the sources narrate different reports which vary from outright accusation to a suspicion of complicity and even to an act of loyalty. However Al-Sallabi believes that these accusations against al-Ash'ath seem baseless as he was a loyalist and was against Kharijites from the time they first appeared and fought them at Nahrawan. He was also the first one to fight against the people of Syria in the battle for the water. Moreover, he believes there exists no narration from the family of Ali ibn Abi Talib supporting these accusations against al-Ash'ath, neither his family did not discuss it with any member of al-Ash'ath's family. After Ali was injured by Ibn Muljam, al-Ashʿath sent his son to determine Ali's condition, his words suggesting that he knew Ali would not survive. Ali's body was washed by his sons, Hasan, Husayn, Muhammad ibn al-Hanafiyyah and one of his nephew, Abdullah ibn Ja'far. Then he was secretly buried by them and 'Ubaydullah ibn Al-Abbas, since it was feared that his body would be "exhumed and profaned". :309 Some sources claim Ali was buried at the Imam Ali Mosque at Najaf in present-day Iraq,:37 while others, usually Afghans, say he was buried at the Rawze-e-Sharif in the Afghan city of Mazar-e-Sharif. Ali's death is commemorated by Shia Muslims every year. After Ali's death, the Shias of Iraq declared Ali's eldest son Hasan the successor to Ali, thus proclaiming him as their new caliph. However, Hasan was not interested in becoming caliph, and to prevent further bloodshed, he signed the Hasan–Muawiya treaty and abdicated in favor of Muawiyah, who became the first caliph of the Umayyad caliphate. Muawiyah died in Medina at the age of forty-five in 669, and was succeeded by Yazid I in 61 AH (680 CE) but Hasan's brother Husayn ibn Ali refused to accept Yazid's leadership. After being invited by the Shiites of Iraq in the same year, Husayn started his march to Iraq. However, during their stay at Karbala, his family was massacred by Yazid at the Battle of Karbala on 10 Muharram (10 October) and his death is commemorated by Shia, while remembered by nearly all Muslims every year during Muharram paying tribute to the grandson of Muhammad's grandson and family's brutal assassination. The incident had been subjects of paintings by Yousef Abdinejad, Farhad Sadeghi, and Masnsoureh Hossein, and a stageplay by Bahram Beyzai. Abdinejad's work is described as showing a "duality" by using colors. Colors of blue spectra, which is "proportional" to turquoise color used for painting Ali, light beams arising from Imam Ali's body and the angles are among the elements used by the painter to inspire a sort of spirituality. On the other hand, Ibn Muljam, the assassin, is painted in brown surrounded by the blue colors and some evil creatures are seen on his feet. There's a flame arising from the body of Ibn Muljam which the painter has used to demonstrate the destiny of the assassin. i.e. hell fire. The imprint of Mohr is seen on the forehead of the assassin. ^ a b c d Veccia Vaglieri, Laura. "ʿAlī b. Abī Ṭālib.". Encyclopædia of Islam, Second Edition. Brill Online. doi:10.1163/1573-3912_islam_COM_0046. ^ a b Martin Hinds. 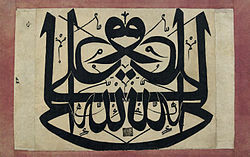 "Muʿāwiya I". Encyclopaedia of Islam (2nd ed.). Brill. Retrieved 21 September 2014. ^ a b Higgins, Annie C. (2004). "Kharijites, Khawarij". In Martin, Richard C. (ed.). Encyclopedia of Islam and the Muslim World v.1. Macmillan. ^ a b c d e f g h i j k l Madelung, Wilferd (1997). The Succession to Muhammad: A Study of the Early Caliphate. Cambridge University Press. ISBN 978-0-521-64696-3. ^ a b c d e f g Veccia Vaglieri, Laura. "Ibn Muld̲j̲am.". Encyclopædia of Islam, Second Edition. Brill Online. Retrieved 3 June 2016. ^ Dakake, Maria Massi (2008). The charismatic community : Shiʻite identity in early Islam. Albany: State University of New York Press. ISBN 978-0-7914-7034-3. Retrieved 4 June 2016. ^ a b c Robinson, Chase F. (2011). The New Cambridge History of Islam. Cambridge University Press. ^ a b Faramarz Haj, Manouchehri; Matthew, Melvin-Koushki; Shah-Kazemi, Reza; Bahramian, Ali; Pakatchi, Ahmad; Muhammad Isa, Waley; Daryoush, Mohammad; Tareh, Masoud; Brown, Keven; Jozi, Mohammad Reza; Sajjadi, Sadeq; Gholami, Rahim; Bulookbashi, Ali A.; Negahban, Farzin; Alizadeh, Mahbanoo; Gholami, Yadollah. "ʿAlī b. Abī Ṭālib.". Encyclopaedia Islamica. Brill. ^ a b c Ali al-Sallabi. Biography of Ali ibn Abi Talib. Darussalam Publishers. ^ Nasr, Seyyed Hossein (2007). "Ali". Encyclopædia Britannica Online. Retrieved 11 March 2015. ^ Poonawala, I. K. (1985). "ʿAli B. Abi Ṭaleb". Encyclopædia Iranica. Retrieved 7 July 2014. ^ Cook, David (2007). Martyrdom in Islam. Cambridge University Press. ISBN 978-0-521-61551-8. ^ Gleave, Robert M. (2014). "ʿAlī b. Abī Ṭālib". Encyclopaedia of Islam (3rd ed.). Brill Online. ^ Abbas, Ali. "The Life of the Commander of the Faithful Ali Ibn Abu Talib (as)". Retrieved 6 December 2015. ^ Reza Shah-Kazemi. Ali ibn Abu Talib. Medieval Islamic Civilization: An Encyclopedia. Taylor & Francis. ISBN 978-0-415-96691-7. ^ Harold, Frank. "BALKH AND MAZAR-e-SHARIF". Retrieved 24 May 2016. ^ Jones, J. Gordon Melton, editor, with James A. Beverley, Christopher Buck, Constance A. (2011). Religious celebrations : an encyclopedia of holidays, festivals, solemn observances, and spiritual commemorations. Santa Barbara, Calif.: ABC-CLIO. ISBN 978-1-59884-205-0. Retrieved 23 May 2016. ^ Moosa, Matti (1987). Extremist Shiites: The Ghulat Sects. Syracuse University Press. ISBN 978-0-8156-2411-0. ^ Campo, Juan E. (2009). Encyclopedia of Islam. New York: Facts On File. ISBN 978-0-8160-5454-1. Retrieved 23 May 2016. ^ a b "An analysis on 'The Assault on Ali' painting". khabaronline (in Persian). Archived from the original on 24 December 2017. Retrieved 23 December 2017. ^ "'The Assault on Ali' painting gets featured in Sa'd Abad artifacts museum on the night of Qadr". Sa'd Abad Cultural-historical complex. Retrieved 23 December 2017. ^ "A painting on 'The Assault on Ali' is unveiled". International Quran News Agency. Retrieved 24 December 2017. ^ "The 'Assault on Ali' stageplay by Bahram Beizayi is on". www.islamicartz.com (in Persian). This page was last edited on 10 March 2019, at 10:01 (UTC).